South Beach is the spot. Why would you want to see the Super Bowl in New York, Indianapolis, Detroit, or Houston? Now South Florida on the other hand, that is the place to be. Ascetically (thank you spell check), I like an outdoor atmosphere as oppose to the dome. 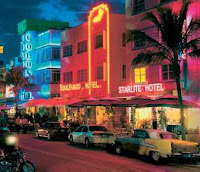 Miami is an exciting city which attracts everyone and has plenty of hotels, beaches, and nightlife. Current players and hall of famers are more likely to arrive on South Beach rather than Detroit, no need to explain. Now before you remind me of the likelihood of rain, I'll take sun and sand on the week leading up and sacrifice a rainy Super Bowl over spending a week in Indiana or Michigan. Now, for the city of New York don't blame the NFL for not wanting a Super Bowl in Gotham, blame the equator. As the Super Bowl approaches and the city of Miami becomes alive there is very little doubt, this is the perfect spot for all of the NFL and the sports world to ascend to every February. Keep It Real up north, we don't want a snow globe Super Bowl! It isn't just Peyton whose got something to play for. Sure, notching his second Super Bowl victory would go a long way in cementing the legacy of a 4x NFL MVP. However, New Orleans Saints quarterback Drew Brees isn't just that. With a Super Bowl win Brees would cap off one of the most prolific passing runs in NFL history. In four straight seasons in The Bayou, Drew Brees has been outright dominating. Amassing four consecutive 4,000-yard passing seasons, back-to-back seasons of 30+ touchdown passes, and over 1,500 completions during this stretch. In 2008, Brees was passed over for NFL MVP by you guessed it, Peyton Manning. A season which the Austin, Texas native would throw for over 5,000 yards and 34 touchdowns. After a 13-3 finish in 2009, a season which saw the Saints take the NFL by storm in dominating fashion, Brees would once again be overshadowed by the Colts quarterback. As Drew Brees leads a once laughable franchise into the biggest game in franchise history, can this quarterback top "the" Peyton Manning, on the games biggest stage? Bringing a Lombardi back to 'Nawlins would make Drew Brees a legend in the state of Louisiana, that's something to play for. Keep It Real! I'd have drafted Reggie as well, and I'd do it again. We were all in agreement that Reggie Bush had the ability to be the next big thing in the NFL upon entering the league in 2006. A couple Pro Bowl appearances from Vince Young and 39.5 sacks in four seasons from Texans standout Mario Williams, and somehow we've all splintered on the future of former Heisman winner Reggie Bush, not me. What's one thing which Vince Young and Mario Williams aren't doing on Sunday? Playing spoiler to the Peyton Manning coronation in Miami, that's what Reggie Bush will be doing. In possibly his least productive professional season, Reggie Bush is making a huge impact on the New Orleans offense. Averaging near seven yards a catch and close to 6 yards a carry, Bush has easily become one of the NFL's most versatile weapons with a head coach (Sean Payton) who knows how to use him. Without being the go-to back in New Orleans, Bush is allowed to share his time in the backfield and stay healthy and more importantly on the field. He's got game changing speed that makes him as dangerous a punt returner as the game has. He has great hands out of the backfield with field vision that strikes fear in defensive backs. If you think Reggie Bush won't be a factor in the Super Bowl, your in for a treat. Keep It Real! The man is a game breaker. Vanilla is in. How different would these past two weeks have been if Brett Favre was in Miami? If Rex Ryan and Brad Childress had embarked on a war of pre-Super Bowl words? If Jets rookie quarterback, Mark Sanchez was starting in the biggest game in his first season? Unfortunately for newspapers and blogs, none of that is going on and not even a sniff of that exists. These past two weeks have been filled with "they're a very good team," "it'll be a tough game," "I've got a ton of respect for what they've accomplished." That's about all your going to get from the two top seeded franchises headed into the postseason. They don't let you know they're the best by saying it, they go out and show you. Two of the games best quarterbacks who don't make FavrESQUE throws, two head coaches who don't attend MMA events, no controversies, just football. You won't get edge and apologies from New Orleans and Indianapolis, that's not how they got here and that has never been more evident than these past two eventless weeks. Someone check the pulse on Jim Caldwell, vanilla is in and that's what your getting. Keep It Real! The Answer. LynchyRightNow needs to have a dog in this fight, right? I want the following things to happen on Super Bowl Sunday: (1) See above, I want Reggie Bush to return a punt for six. (2) I want a two minute pre-halftime touchdown drive from Peyton Manning, it's fascinating. (3) I want Dwight Freeney to be a factor, and the injury controversy to be thrown out the window. 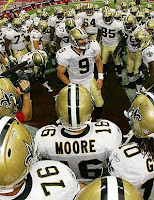 (4) I want Saints TE & former Hurricane Jeremy Shockey to show up in a big way in crunch time. (5) I want Jim Caldwell to lose a challenge before being replaced by a scarecrow for the remainder of the game, per Peyton's orders. (6) I want Jonathan Vilma and Darren Sharper to contain the coronation for long enough to make this game exciting. (7) I want Colts receiver Pierre Garcon to have another monster game, and celebrate as he did in the AFC title game. (8) I want no rain, these are high powered offenses who don't need to be reduced so we can see some smash mouth football, that's a bad thing. (9) I want to leave the room when Tim Tebow's commercial about pro-life comes on, I don't mix sports and politics (10) I want the Colts money line at -250! Keep It Real, it's all about the money babbbbbyyy!!! !